Providing you the best range of belt conveyor, rubber belt conveyor, assemble belt conveyor, roller belt conveyor, belt conveyors and pu belt conveyor with effective & timely delivery. 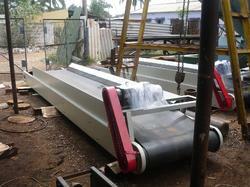 Our clients can avail from us a comprehensive range of Belt Conveyor. Conveyor Belts being offered by us are manufactured using latest machinery and premium quality raw materials. These find wide application is conveying and transferring of empty, filled bottle, containers and jars. Available with us is a wide range of Packing Belt Conveyor that are rigid and vibration free in construction, with adjustable height conveyor belts. 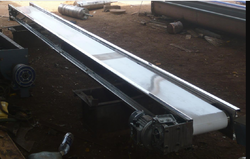 We are the leading manufacturer and supplier of Belt Conveyor in Tamilnadu, Kerala, Coimbatore, Tirupur, Karur, Salem, Chennai etc. We are instrumental in offering an immaculate array of Rubber Belt Conveyor. The range includes conveyors for conveying light, medium and heavy loads along different conveying paths like inclination, curve etc. The belt is made available according to the specification of the customer with different plies of nylon and cotton fabric. We are the leading manufacturer and supplier of Rubber Belt Conveyor in Tamilnadu, Kerala, Coimbatore, Tirupur, Karur, Salem, Chennai etc. We make available a qualitative range of Assemble Belt Conveyor. This is done to match the growing demands of our wide range of customers. 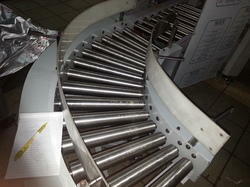 These conveyors are used in varied industries and sectors, especially heavy duty industry. These are robust and sturdy in construction that makes them widely used in various severe conditions. We are the leading manufacturer and supplier of Assemble Belt Conveyor in Tamilnadu, Kerala, Coimbatore, Tirupur, Karur, Salem, Chennai etc. We are the leading manufacturer, supplier, and trader of the Belt Conveyor. We are committed to achieving excellence in our domain and thus, designed the offered product with superior-grade raw material and other components incorporating the latest technologies. Conveyors that are made by using the best grades of basic components and are used extensively in mining, coal, and other industries. Our clients can get the offered product at the highly affordable price range. Our organization has rich expertise in manufacturing a quality-approved range of Roller Belt Conveyor. We offer our Roller Belt Conveyor, trough type rollers, and plain roller conveyors at industry leading prices. Its cost effective prices and qualitative features have earned a number of clients to credit. 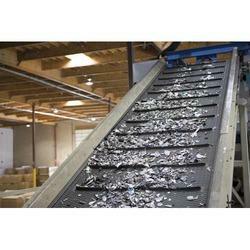 It is especially useful when an incline or decline is included in the conveyor path. We are the leading manufacturer and supplier of Roller Belt Conveyor in Tamilnadu, Kerala, Coimbatore, Tirupur, Karur, Salem, Chennai etc. Our company specializes in offering qualitative range of Conveyor Belt manufacturers. This product is manufactured from quality has proven raw material as per international standards. These products are easily available in customized as well as standard form according to the varied requirements of our customers. These belts are available with us at industry leading prices. We are the leading manufacturer and supplier of Conveyor Belt in Tamilnadu, Kerala, Coimbatore, Tirupur, Karur, Salem, Chennai etc. We are a leading name engaged in manufacturing of PU Belt Conveyor. We are engaged in offering high-grade PU Belt Conveyor to our clients. These are highly durable and appreciated by the customer for its better quality. Our products are well known for their durability and strength. Sidewalls and Cleaned conveyor belts are also available as per customers specification. We are the leading manufacturer and supplier of PU Belt Conveyor in Tamilnadu, Kerala, Coimbatore, Tirupur, Karur, Salem, Chennai etc. The PU Pouch Packing Belt Conveyor is produced using the latest technology and high-quality raw materials. These are extensively used in various industrial processes for carrying bulk material & packed bags along with boxes and pouches. These are actively used for the purpose of carrying heavy loads, such as agricultural products, food & beverages, and other items. We are the leading manufacturer and supplier of PU Pouch Packing Belt Conveyor in Tamilnadu, Kerala, Coimbatore, Tirupur, Karur, Salem, Chennai etc. We offer a spectrum of Trough Belt Conveyor, which is fabricated using premium grade raw material. These Trough Belt Conveyors enable hassle-free transportation of material from one place to another. 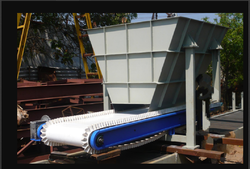 Trough Belt Conveyor uses the continuous or indirect movement to transport cargoes which have different weight. This product is widely used throughout various industries to convey bulk material from one location to another. We are the leading manufacturer and supplier of Trough Belt Conveyor in Tamilnadu, Kerala, Coimbatore, Tirupur, Karur, Salem, Chennai etc. 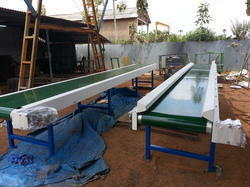 Leveraging on our years of knowledge & experience of this domain, we are offering a wide range of Flat Belt Conveyor. Our range of conveyors is easy to install and have low maintenance cost. 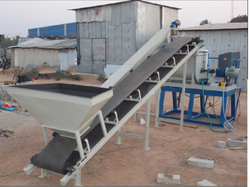 These flat belt conveyors are extensively used for carrying bulk raw materials such as seeds. Belt conveyor uses the continuous or indirect movement to transport cargoes which have different weight. We are the leading manufacturer and supplier of Flat Belt Conveyor in Tamilnadu, Kerala, Coimbatore, Tirupur, Karur, Salem, Chennai etc. Our company has been acknowledged in offering Flat Belt Conveyor to the clients which are used to transport heavy goods from one place to another, our offered belt conveyor is designed with superior grade materials keeping in mind quality norms. Our provided conveyor is used in several industries for transferring of goods from one level to another and is widely demanded in the industries like textile, food processing, chemical, textile, etc. Additionally, this conveyor is sternly tested on various quality parameters before final dispatch.